 Readily available almost everywhere. You can find this material at building sites, lumber stores, and many other places. Just make sure you ask permission before you start wandering around somebody's construction site or other place of business.  Relatively inexpensive. As we said earlier you can even get this type of bedding for free.  Cheap and easy to come by when the construction industry is thriving.  Heavier to load and muck than straw, shavings or wood chips.  Horses with respiratory problems should not use this type of bedding.  I do not advocate this type of bedding as it can cause health risks for both you and your horse. 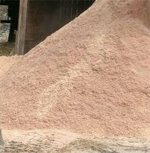 Move From Sawdust bedding Back To Horse Bedding.